There's a show on TLC called "I Didn't Know I Was Pregnant." If you're not familiar with it (!! ), the basic premise is this. They tell the stories of women who, for one reason or another (e.g. negative pregnancy tests, continued menstruation, tubal ligation, and often but not always excess body weight), manage to remain completely unaware of their pregnancy until the very end. Sometimes up until the point that the baby is out and crying. Oh! Surprise! Well, here on the occasion of the birth of my blog, I too am caught off-guard, surprised at the sudden existence of something I never really thought I'd have. But in hindsight I realize that it's been developing for many months, somewhere slightly below my conscious awareness. My first symptom was a feeling of uneasiness -- vaguely but undeniably unsettled. I'm a person who likes to have big, well-defined goals and then work very hard to progress in a straight line towards those goals. I love it when a plan comes together. And my life has been almost exclusively based on one very specific plan: to become a principal investigator (PI) conducting biomedical research at a major university. The idea of advancing knowledge that might help humanity in some way, like curing a disease, was all the motivation I needed. A truly grand goal. However, trouble began to arise when I honestly observed the realities of a PI's career. An increasingly competitive research climate, rapidly diminishing sources of funding, a system that seems to favor intense and aggressive personalities... Handling these issues is critical for success as a PI but involves an entirely different skill set than simply being a good scientist. Could I really be successful? And even if I was, would I be happy? I still don't know the answers to these questions. But in asking them for the first time, I was suddenly facing uncertainty. Nauseating & terrifying. If I wasn't pursing that one goal, then what on earth was I doing? In acute pain & distress, I rushed to the emergency room. By which I mean I talked to friends and mentors about my career crisis. We quickly ruled out any terminal condition. Instead we focused on other possibilities: what do I enjoy doing and how could I use those skills to my advantage? I love science, obviously. But I also love writing, distilling information, performing (including teaching & giving presentations), and doing various creative things, especially music. So then what about a career in science journalism, or media, or teaching? These possibilities all sounded exciting to me. And the advice I heard again and again was to practice communicating about science on a regular basis. Translation: a blog! I'd already spent a fair amount of time preparing scientific info for other people, through various forms including presentations and even a couple songs. So it made perfect sense to collect ideas in one place and continue the practice in an ongoing way. A blog - of course. The symptoms had been there all along. How had I missed them? Now the images from the ultrasound (stick with me on this metaphor, okay?) were undeniable: there was something alive & growing that I couldn't ignore anymore. Shortly thereafter, I entered the labor of putting an actual site together. So today I celebrate the birth of my science blog. Still in a bit of shock but excited about the possibilities! This is an opportunity for me to exercise some creativity and share interesting scientific info with anyone who wants to listen. Whichever direction I end up choosing for a career, it's become clear that a blog is a great place to start. It's good practice for so many skills -- writing about science for a broader audience, summarizing and explaining current research topics, exploring science outside of my specialization (neuroscience), presenting information in a variety of creative ways, etc. 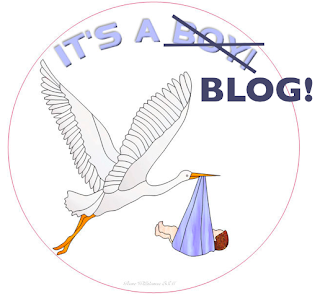 Like any good parent, I will try to feed my blog at least once a week. And who knows, maybe some day it will grow up to be president. Or at least be useful preparation for a career. Now break out the champagne, smoke a cigar, and subscribe if you're interested! I promise, no more childbirth metaphors from now on. Hey Robyn! Happy birthday to your blog, your writing is lovely and it's a great pleasure to read you! You always walk in a strait line and don't know wich career to choose. I think that focusing on a single carreer is a modern way of thinking not so useful at at all. You can just follow your interests, all of yours, without giving a damn if it won't be "productive" in the short time. Take your time and do what you like without naming it. Playing music is probably as useful and neccessary to you as your "regular" job, and music, you know it better than me, is a key to "enter" in the most obscure brain processes. So, my suggestion is: don't be scared about names and priority and dignity other people give to things. Choose your own priority and your own freedom. You're not forced to go straight and fast to the goal, look around you and enjoy you trip! a 10 years engennering student who is now a Ukulele player and video director. I must admit I've been worried about you for a long time. I thought we lost you in your blinders. I like telling the story of the young lady who came to my lab 30 years ago asking if she could try her hand at bench science. Six months later, with enough of that experience under her belt, she went the other way. Not for her, man! You see, I gave her the opportunity to discover what she did not want to do the rest of her life! Total success; one of my major successes as a mentor. You fit into that category too, because I was an early mentor of yours in science; you were indeed my best science student ever. We adventured together in jazz performance as well, at a time when you were toying with the idea of following your extraordinary musical talent forward, in place of science. Fortunately, you did not follow that path -- a potential waste of your scientific brilliance -- and kept the music limited, subdued, on-hold ...better for a later time..But always concious of the fact that "music self-made is happiness self-made". You appear to be acting on it again. I hope you will appreciate my early mentoring for at least two things: arguing sucessfully against you're pursuing an MD-PhD program. And "PI-modeling" for you...showing you what the rest of your life would be like as a PI in the Big U. Another success! I look forward to the next chapter! Yay! I'm looking forward to keeping up with your meanderings. I'm so glad I was able to introduce you to Joe (he thinks so too). And happy you're expanding your horizons. Can't wait for more jazz down the line as well. Excellent. Can't wait to see what you end up doing! Also, help me practice being intense and aggressive. Grrrr. Good luck! I left the world of science but it helped me start a career as a consulting actuary. And I've keeping up with my music as well! Best wishes in your endeavors.